The River Folk Festival Announces 2019 Youth Mentoring Program in partnership with The Upper Yarra Musicians Collective, funded by Bendigo Community Bank, Warburton and Yarra Junction! Backstage Passes to their mentor’s gig at the 2019 River Folk Festival. 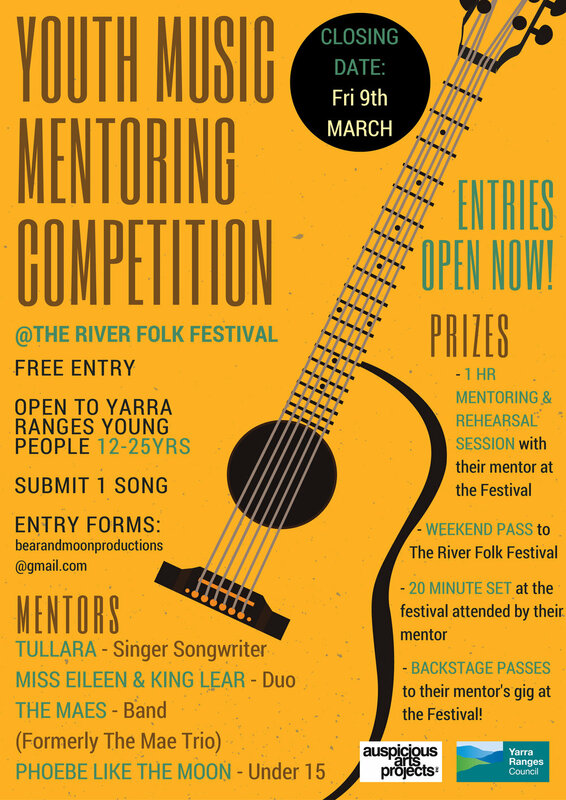 Bear & Moon Productions are proud to announce the first annual Youth Music Mentoring Competition as a part of The River Folk Festival 2018, an exciting opportunity for local young people to be mentored by professional performers. Backstage Passes to their mentor’s gig at the 2018 River Folk Festival. Entry to the competition is FREE and open to musicians between the ages of 12-25 years, who are residents of, or attend an educational institution within, the Yarra Ranges Local Government Area. Submit 1 original song in video or music file format with ENTRY FORM. The competition is OPEN NOW, and closes at 9pm Friday March 9th 2018. ENTRY FORMS AVAILABLE FROM bearandmoonproductions@gmail.com. 23 year old Australian singer/songwriter Tullara has quickly developed a reputation as one of the country's brightest up and coming performers. Known for her renowned guitar playing ability,Tullara has an endearing stage presence full of raw, powerful honesty, and swagger. Hailing from Northern New South Wales via Melbourne’s north, Eileen Hodgkins (guitar/vocals) and Lear Hodgkins (drums/mandolin/vocals) combine forces in their harmony-rich mix of rock, indie-folk and pop stylings, creating a dynamic show that is at once intimate and energetic. The Maes (formerly The Mae Trio) are sisters Maggie and Elsie Rigby. They perform an insightful collection of original songs arranged for ukulele, banjo, guitar, fiddle, cello, bass and superb three part vocal harmony. Winners of Best Folk Roots Album @ The Age Music Victoria Awards 2017, NFSA Folk Recording of the Year 2014, Maton Class Act Award 2014, Folk Alliance Australia Youth Award 2013 and the Lis Johnston Award for Vocal Excellence 2011. Born and raised in Byron Bay, Phoebe like the Moon is a folk singer, composer and multi-instrumentalist now based in the Yarra Valley. Hailed as a cross between Bjork and Kate Miller-Heidke, Phoebe like the Moon is known for her intricate, haunting melodies and powerful, captivating performances.